Japan: before and after the tsunami and earthquake. You have to feel sorry for the people of Japan. It’s rare that a place suffers one natural disaster, but Japan has been hit with two natural disasters in a row, much like Indonesia was. In Japan’s case, it was a massive earthquake followed by a massive tsunami, then more earthquakes. 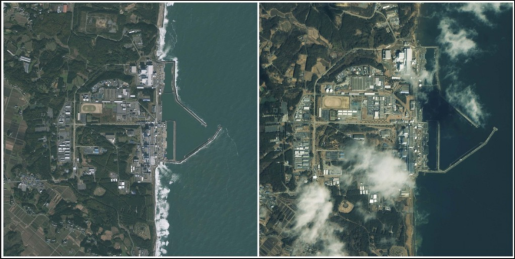 It’s looking to be pretty bad for the Japanese people, but if you want to see how bad things are, the Washington Post has a great set of satellite images of Japan before and after the disasters. Experts say that the Japanese disaster is the worst thing to happen to Japan since World War II, and I’d believe it. When you see the damage right there on the screen, it’s stunning. Between the power of the earth and the power of the damaged nuclear plants threatening to explode, there’s a lot of unpleasant stuff in the future for Japan. Still, if any country can recover from disaster, it’s Japan. I lived with Japanese kids in college, and if they can handle flying across the world and spending a few years going to college in America, they can do pretty much anything.